The Internet of Things is transforming the modern world in manifold ways. It’s making our homes smarter, our stores more connected and informed, our vehicles more powerful, and our equipment — especially the industrial variety — more capable. “IoT” is a blanket term that refers to the entire network of connected devices, from smartphones to household appliances. IoT devices have the ability to connect with local or public networks to transmit, receive and process data streams. This means that, as a society, we can collect a lot more information about how our devices are operating. It also means we can interface with them remotely to do things like open a garage door or turn on a light from hundreds of feet or even miles away. This technology offers a variety of benefits, including more efficient use of resources and improved sustainability practices. That’s especially true of the transportation sector and modern travel. The IoT provides an added layer of convenience for customers and better sustainability for parent companies. For customers, the technology can be used to improve their travel experience. Miami International Airport, for example, relies on connected smartphone applications to provide real-time information to passengers about campus events and locations, baggage claim info, boarding instructions and more. As for airports themselves, the technology can help eliminate excess waste produced as a result of high energy use. Smart bulbs and connected light fixtures, for instance, can turn off lights in empty areas of the campus. Efficient thermostats can better regulate and coordinate air temperatures within the facility — not just for keeping people more comfortable, but also to use less power in the process. Whether you’re talking about buses, above-ground trams, or high-speed trains, the logistics involved are incredible. A transport company must consider how much room they have, how many people have booked a trip, what’s changed — such as who’s canceled or joined — and even how much luggage or storage space is available. But it doesn’t stop there. Vehicles need fuel, supplies, and maintenance — and they’re all directly tied to a strict and comprehensive schedule. Like you see with flights, if a bus or other transport is late, it affects the entire day’s schedule. IoT technology can help with this by providing more nuanced and real-time details about the goings-on within a facility or transport. This provides much more oversight for transportation managers and planners, if not automating the entire field outright. GPS modules can be used to track each transport with up-to-date stats like speed, fuel levels and arrival times. Bluetooth beacons can be used to deliver local information to customers’ phones and devices, with real-time alerts about delays or on-time schedules. There’s incredible potential here, and the industry is definitely starting to catch on. 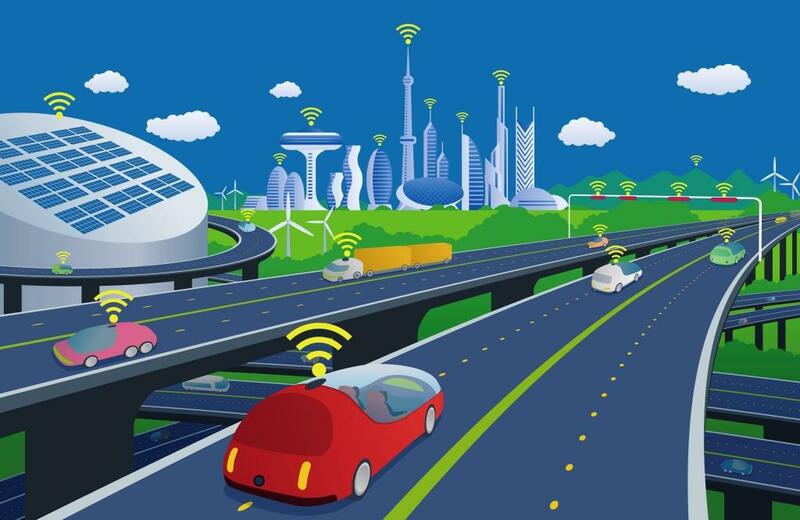 As you’d expect, smart and connected roads can help manage traffic patterns, accident response, and other related problems. Imagine receiving traffic updates on your phone directly from the very road beneath your vehicle’s tires. Highways and street surfaces can be outfitted with advanced sensors to collect usage information, which is then fed into a municipality’s traffic infrastructure. The system would be connected to traffic lights, security cameras, smart roads and much more. It’s essentially a comprehensive modern and smart traffic management system. Sensors could pick up the impact of an accident, for example, and report that information to a remote agency or even take action via the network. As a result, nearby drivers are informed of the crash, traffic lights are changed to reflect the issue, and vehicles are rerouted until the area is cleaned up. The technology can also be used for public road services like tollway, bridge and tunnel management — and even parking meters in urban areas. Imagine pulling up to a parking meter, paying your fee on a mobile app, and then exiting your vehicle to be on your way. Upon your return, you simply hop in your car, tell the meter you’re leaving and away you go. The system registers the open space and alerts other drivers nearby looking for a space. As a result, the nearby roadways remain clear and less congested. In urban areas and bustling cities, parking can be a real problem for the entire community. It can cause traffic disruptions and delays, accidents, and even dangerous scenarios — like when a vehicle is parked in front of a fire hydrant or unauthorized area. Disney’s new parking garages in Disney Springs, Orlando, are a great example of how parking is getting smarter. Each parking row has a series of lights that turn red or green depending on whether or not space is available. As the end of each row is a digital display that shows the number of open spaces. It’s all updated in real-time so drivers can find a space quickly without driving around aimlessly. The system can also be used to locate vehicles for guests who are lost. In addition to self-driving transport vehicles and fleets, various other forms of transport in the supply chain are being outfitted with IoT technologies. This includes shipping trucks, containers, boats and ships, planes and more. This provides a great deal of insight for management crews about travel times and external factors such as traffic or weather events. As with public transport, technology can be used to make more efficient use of resources like fuel as well as cut down on overall waste. More importantly, it can be used to identify new routes, transport solutions and even operational improvements. In the consumer market, IoT devices can help homeowners use their power supply more efficiently by cutting down on consumption, making better use of it in general and offering several new functions. Smart thermostats, for example, can auto-regulate heating and cooling in the home to make the space more comfortable and also eliminate excess use of electricity. The same thing is happening in transportation, only on a much greater level. When an entire public transport operation is outfitted with more efficient vehicles and fuel-measuring sensors, for instance, the impact is much larger. This shows that IoT and related connected technologies are not just a fad confined to modern-day operations — they are absolutely going to shape the future of the world. Backed by powerful data and insights, the organizations of tomorrow will be more efficient, more sustainable and much less impactful on the environment.